A French drain is a general term used to describe a drainage system placed in the ground to move water away from your home and prevent water related damage. They can be particularly helpful in regions with higher precipitation, like the Seattle-Tacoma area, where basements and crawlspaces are more at risk of flooding. Typically the soil is removed from the affected area and replaced by a perforated pipe and drain rock. The perforations in the pipe allow water to flow into the pipe and the rock prevents the trench from collapsing and the free flow of water. French drains are typically placed on the outside of a building’s foundation to protect the basement or crawl space from taking on water and are commonly installed in wet and soggy yards to remove standing water. French drains can also be placed on the inside of the house to protect critical areas like basements and crawl spaces. The water is then routed away from the structure where it can be discharged or re-distributed in an effective manner via gravity or a sump pump system. Good French drains are installed below the impervious or clay layer of soils to collect the water than runs horizontally on top that cannot saturate into the ground. 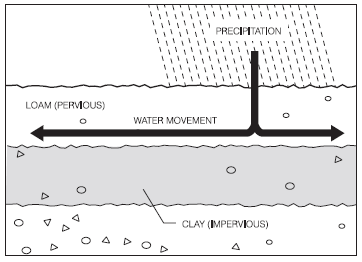 French drains should be placed at the lowest possible point to lower the water table around that structure. The trench should be lined with a filter fabric to prevent dirt and sediment from getting into the rock field so the rock and pipe do not get clogged over the long term. Large rounded or large course crushed drain rock is best. Small rocks or pebbles (pea gravel, 5/8” crushed rock) may compact and not allow water to flow through the system. If you have a water problem and want to learn more about the solutions that French Drains can offer your Seattle or Tacoma, WA area home, to solve your water problem for your basement or crawl space, call Perma Dry Waterproofing at 206-233-9003 today. Footing Drain – A perforated pipe system placed outside of the foundation just below the footing and foundation of structure, most commonly around a basement. Basement Drainage System – A drainage system installed inside the home under the basement concrete floor to remove water and prevent flooding. Typically less expensive and evasive than outside footing drains. Crawl Space Drainage – A drainage system installed inside the crawl space, around the perimeter of the dirt crawl space to keep it free of standing water. Roof Drain Tight Line – A solid pipe system installed outside to remove roof and rain waters away from a building or structure. Roof pipe failures are a major cause of basement and crawl space foundation water problems. Strip / Trench Drain (For Driveways) – A trench is cut across a driveway usually closest to the garage door and a specialty shaped drain with an open grate across the top allows surface water to enter the pipe and route away from the house. 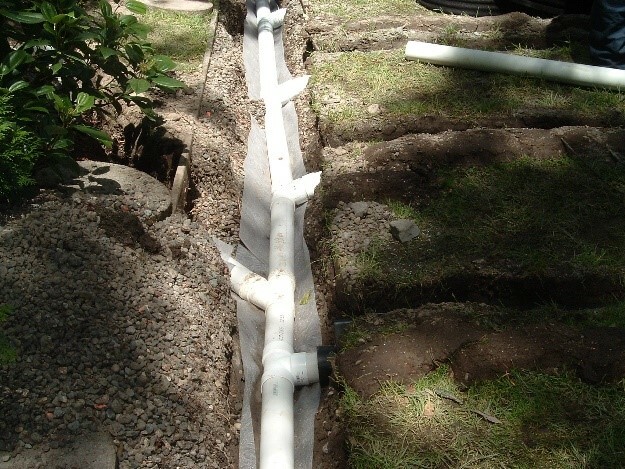 Yard Drain – A standard French drain is installed in a yard or planting area to collect standing water in a yard so soils can dry out to help prevent muddy or mushy conditions.